We’ve added a new setting for your layout: now you change the number of comments displayed per page in your IntenseDebate comment section. This has been a popular request, so we’re happy to deliver on it. While the default setting is 25 comments per page, you can choose to display 10, 25, 50, or 100 comments per page. Please keep in mind that displaying more than 25 comments may result in an increase in load time since we will be loading more data. We are continuing our work to optimize this and improve load times for larger volumes of comments on a single page. Currently comment threads collapse by default when there are 25 threads on the page. Changing to the number of comments per page will also change the thread collapse number. So setting 50 comments per page will set the thread collapse at 50 threads. 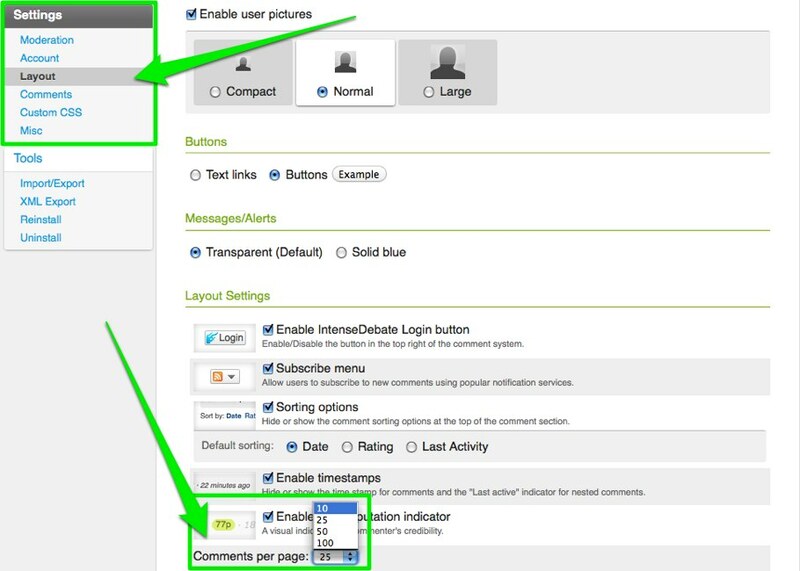 Currently this setting cannot be disabled completely, but we hope this will help improve your commenting experience. You can customize this setting in your Layout Settings page at http://intensedebate.com/edit-site-layout. Thanks again for your feedback! One twist on this that might be good would be if you could make it conditional on how ID is performing that day – of course, your aim is to make ID lightening fast at all times but, realistically, there will always be times when the service struggles, at those times it would be neat if the setting could automatically jump back to 25 rather than make the page-load take an inordinate amount of time. In normal circumstances, however, 50 or 100 comments is great because users are much more likely to keep reading down a page rather than click through to a new one. Also, commenters on popular posts will feel happier than if their comment is knocked off the first page. Good all round (except on days when the service is slow!). Thanks for the feedback. That's a cool idea. The inconsistency could cause some UX confusion but it might be worth it to ensure quick load times. Definitely worth exploring. Is it at all possible to use this feature for comments that I view that are powered by intensedebates? In other words, the blog is not my own, but I would like to customize the amount of comments I can view while logged in to my account. Specifically, I am referring to Macleans.ca comments. Unfortunately this is set by the site admins. It's a cool idea though and definitely something we'll keep in mind. You're all set. I've verified your account. Please email me at support@intensedebate.com with your URL and we'll be happy to help. Thanks. On an active multipage comments thread, how does one obtain the latest comments for viewing, short of refreshing the page and being thrust back to Page 1, then clicking through to the end to see if anything new has appeared? There must be some trick I'm missing, yes? Because refreshing and clicking through seems awfully inefficient. Surely that can't be what thousands of users are sitting around doing constantly just to read an ongoing conversation. That's like a recipe for severe mass frustration. Is there a "retrieve latest comments" button I'm not seeing or something? You can see the latest comments by selecting the "Last Activity" sort option at the top of the comment section (details below). Currently the comments do not update live, but this is something we're looking at for future implementation. Are you still encountering the issue? Your avatar showed up here.